I am reviewing your lecture notes and am struggling to understand the section on the consumer budget line, especially the interpretation of its slope. I thought the slope of a line is “vertical change over horizontal change” or “rise over run.” But your notes say the slope of a budget line indicates the opportunity cost of having one more unit of the good represented on the horizontal axis in the graph and can be measured by the price ratio of the two goods. Come again? I am so confused! Maygen is considering purchasing two goods, spinach and bread, with her limited food budget of $24.00 a week (alas!). Spinach costs $4.00 a bag and bread costs $2.00 a loaf. At one extreme, if Maygen spends all $24 on spinach, she will have 6 bags of spinach and no bread. Denote this consumption combination on your graph by (B, S = 0, 6), where B and S denote bread and spinach, respectively. Alternatively, If Maygen gives up 2 bags of spinach, giving her $8 for bread, she can purchase 4 loaves of bread and 4 bags of spinach; that is, (B, S = 4, 4). If Maygen gives up 2 more bags of spinach, she can purchase another 4 loaves of bread, resulting in a combination of (B, S = 8, 2). Finally, If Maygen buys no spinach, she can increase her bread consumption by another 4 loaves, from 8 to 12; that is, (B, S = 12, 0). Note also that the budget line is downward sloping with a slope of-0.5. Why is the budget line downward sloping? What does the slope of -0.5 mean? Let’s take a look. Like you mentioned, we typically compute the slope of the line as the ratio of vertical change over horizontal change when moving from one point on a line to a different point. If we move from (B, S = 0, 6) to (B, S = 4, 4), the vertical change is -2 and the horizontal change is +4. That makes the slope of the budget line -2 over 4 OR -0.5. This applies to any straight line. In the case of a budget line, the slope can also be computed as the negative of the price of bread over price of spinach (i.e., the price of the good represented on the horizontal axis over the price of the good represented on the vertical axis). Indeed, the negative of this price ratio is -$2/$4, that is, -0.5. Maygen has a fixed food budget, so buying one type of food means giving up some of another type. This makes the budget line downward sloping. The amount of the other type of food that Maygen has to give up is the opportunity cost of having more of the food product Maygen acquires. In this case, Maygen gives up 2 bags of spinach in order to gain 4 loaves of bread [e.g., moving from (B, S = 0, 6) to (B, S = 4, 4)]. 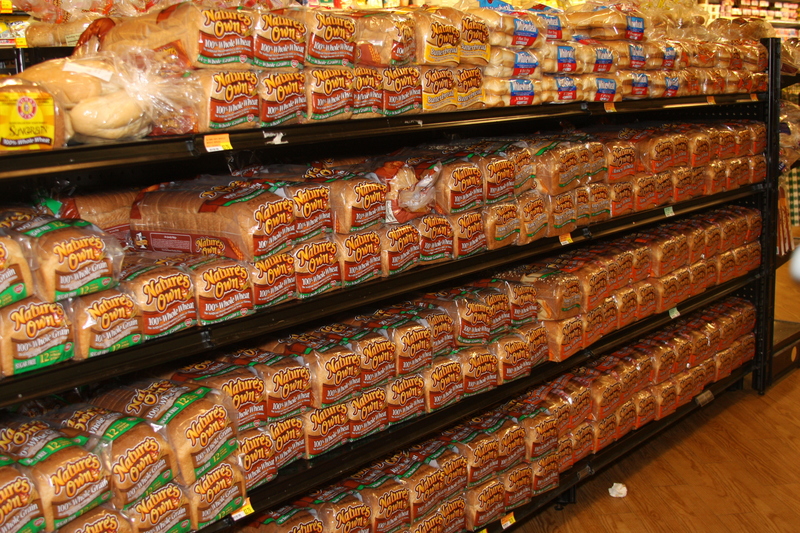 If we divide both numbers by 4, we figure that Maygen has to give up 0.5 bags of spinach to gain 1 loaf of bread. In other words, the opportunity cost of having one more loaf of bread is 0.5 bags of spinach. 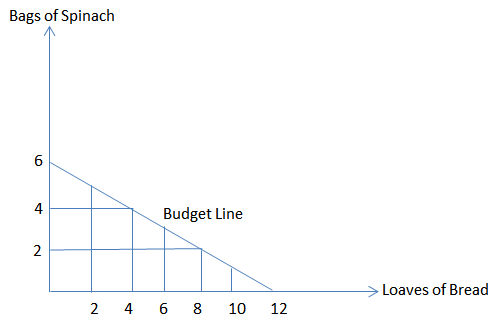 This opportunity cost of having one more loaf of bread (the good represented on the horizontal axis) is indicated by the slope of the budget line, – 0.5 (the minus sign implies “giving up”). On the other hand, what is the opportunity cost of one more bag of spinach? Let’s reverse the words “give up” and “gain” in the preceding paragraph: Maygen has to give up 4 loaves of bread to gain 2 bags of spinach [e.g., moving from (B, S = 4, 4) to (B, S = 0, 6)]. If we divide both numbers by 2, we figure that Maygen has to give up 2 loaves of bread to gain 1 bag of spinach. In other words, the opportunity cost of having one more bag of spinach is 2 loaves of bread. Note that this opportunity cost of having one more unit of spinach (the good represented on the vertical axis) is indicated by the reciprocal of the slope of the budget line, -2 (the minus sign implies “giving up”). Want to learn more? Check out these additional resources!